Sugar Pine Mine - Bureau of Land Management Abuse: Who Signed the Sugar Pine Mine Shut-Down Orders? Who Signed the Sugar Pine Mine Shut-Down Orders? For some time now, we at the Sugar Pine Mine have had a mystery on our hands. Out of the blue one day, one of our researchers asked “Who signed the Sugar Pine shut-down orders? And we went “Uh, dunno!” It had not occurred to us that something this fundamental to a legal case would result in that sort of a question having to be asked. But it was so potentially huge an issue that we decide to ask the Bureau of Land Management, thinking they would just tell us; no problem. But, oh, no. No, no, no. Of course not. We should have known better, judging by their petulant, arrogant, superior behavior up until now. We had to send a Freedom of Information Act (FOIA) request to the BLM, containing a very simple question – who signed the Sugar Pine Mine Non-Compliance notices? When they finally responded, they said that information wasn't FOIAble, they didn't have to provide that information, and they were not going to. The very act that shut down our mine, that instructed us to destroy our mine workings and the improvements we have made, and our personal property, was signed by persons unknown to us. 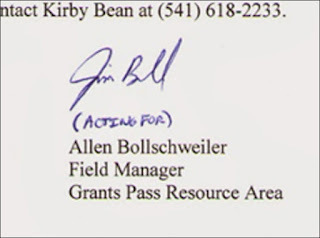 Then we contacted the person whom the notices were signed on behalf of - the Grants Pass Resource Area Field Manager. 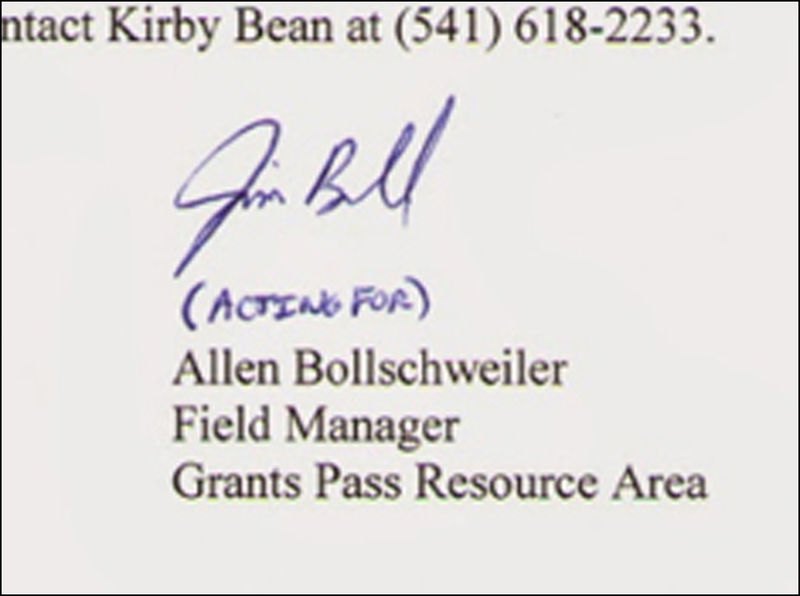 We asked him, via a green-carded letter, who is the signee “acting for” you? He has not responded. So, BLM have brought a legal case against us, that is still going on two years later, and we are not permitted to know who signed the notices that turned our lives and livelihoods up-side-down, and cost us tens of thousands of dollars. Once again, as is their habit, they are obstructing justice, infringing our rights, and subverting due process. This is what they have done right from the start. This is what BLM do as a matter of course. It is just business as usual for the corrupt, compliant Renfields who work for that agency of seditionists. This name, whatever it says, looks like "Jim Bull" to us, which would be a definite problem! We've not even made an accusation regarding the signature, one way or another. We just asked a question. Why will BLM not tell us who signed it? They're not even claiming an exemption, like they usually do, that releasing the information will endanger somebody's life. Gasp! Oh, the drama! What are they hiding? Oh, no, they didn't? Did they? Did they have an underling sign a false name to indemnify themselves against prosecution, because they knew that the mine was Pre-55? Or did a certain employee, hell bent on possessing our Stamp Mill - by any means necessary - sign the notices with a bogus name, not thinking the notices would be challenged, thinking we would walk away rather than face the regents at BLM? Oh, and by the way – WE KNOW WHAT YOU DID, BLM. Just in case you're wondering. And we'll see you in federal court. No matter how much stonewalling you do, no matter how many times you block us from accessing information, no matter how many thousands of dollars you try to extort us for when you don't want us to see something, no matter how many hundreds of redacted pages of nothing you make us pay for - we're not going away. You must face this. What they have done is an absolute outrage. It should shock and appall every single American. This is what they do in countries we disparage, with hereditary dictators and a compliant, afraid citizenry. This ain't North Korea. This is America. We have a Constitution. We have Acts of Congress. And lawyers. Right, T? We have known about BLM Medford's desire to take our mines and our Stamp Mill for years – we've known since before we even owned them, since they decreed their plans in public! This dispute was not over the Surface Rights – which BLM know this mine has. They've always known. They've never challenged the surface for the last 50 years...since the last time they tried to shut down the mine and sever the surface. They failed then too. No, this is all about the Stamp Mill, and two socio little geeks who think they have a government license to steal. 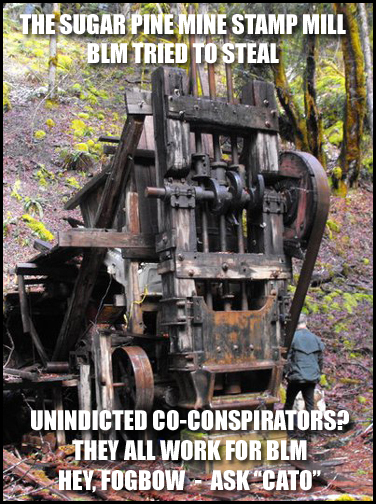 To add to these crimes against us, the very person who INSTIGATED this whole thing – a BLM Medford District AML Unit employee – ran around the internet to defame us, libel us, and put our lives in danger from being raided by the Federal Government, all with malicious, vindictive lies because we stopped him from taking our Stamp Mill. Of course, we'd love to just release all the evidence and info on these traitorous sociopaths, but we'd just be accused of endangering their lives. We'll just let the federal court subpoena what they won't hand over to us. We have filed several DOI OIG complaints. (Department of the Interior Office of the Inspector General) about this particular employee. We have been notified that the complaints were passed on to BLM Internal Affairs. We are currently in contact with the Office of the Attorney General / Department of Justice regarding criminal conspiracy charges. Attorney General Sessions himself will personally receive a copy of our complaint. And you thought you got away with it, didn't you? Of course you did. No filthy little oik was going to stand in your way, were they? But justice, much like revenge, is sometimes better served cold. And patience is a virtue. And remember this, “Cato,” when you're sitting in your jail cell, contemplating how such a formidable intellect as yourself could end up there, just remember it was us, the “non-college graduate... douche bag miners” you revel in looking down your nose at who put you there. It is an absolute outrage and just like You have said..What they have done is an absolute outrage. It should shock and appall every single American. This is what they do in countries we disparage, with hereditary dictators and a compliant, afraid citizenry. Yes, it is an outrage...and their behavior gets more outrageous as time passes. I have done some small time Gold Mining and have lost claims to those with more money. Items were stolen, shelters were burned. I am sympathetic to your cause. I give you my support. Thank you for your support, Pat. I'm sorry you've been through so much with your mining claims - goes with the territory, unfortunately. And there are ignorant people out there, like Fake News "reporter" Tay Wiles (High Country News,) who think that cabin burnings are a "conspiracy theory." But what can you expect from a Soros-funded Green Decoy gang? Nothing more. Have you considered acquiring other documents signed by employees of this particular office and sending handwriting/signature samples to an expert to deduce which employee fraudulently signed? We're not saying it is fraudulent - and we didn't make any sort of accusation when we asked them who signed it. We just wanted to know who did. But, alas, if there was nothing sinister to find, they would have just answered the damn question. With so many liars and thieves working for that traitorous agency, you never get a straight answer about ANYTHING.